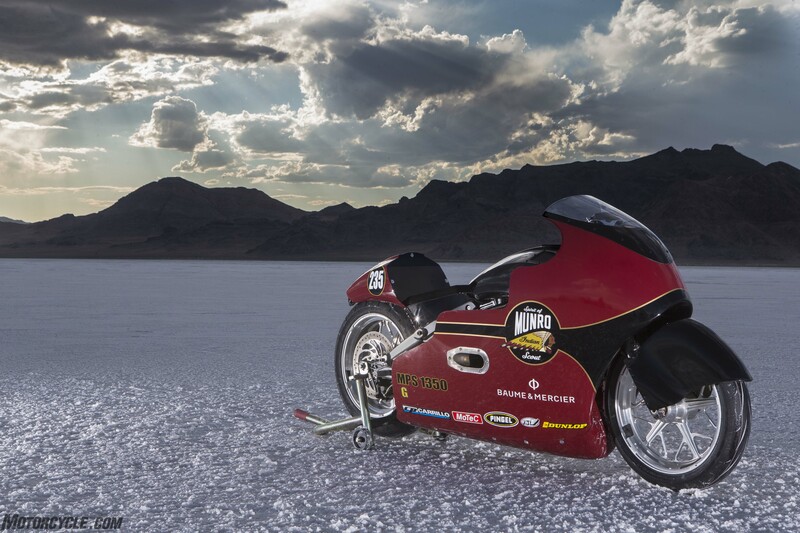 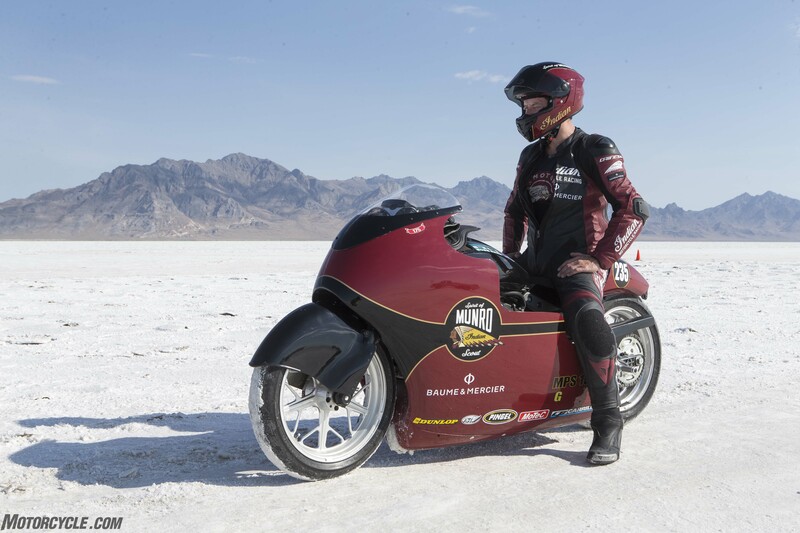 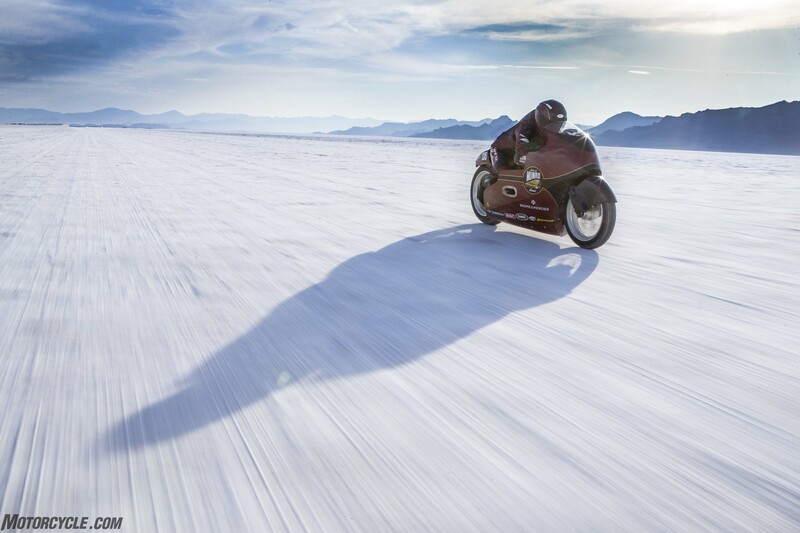 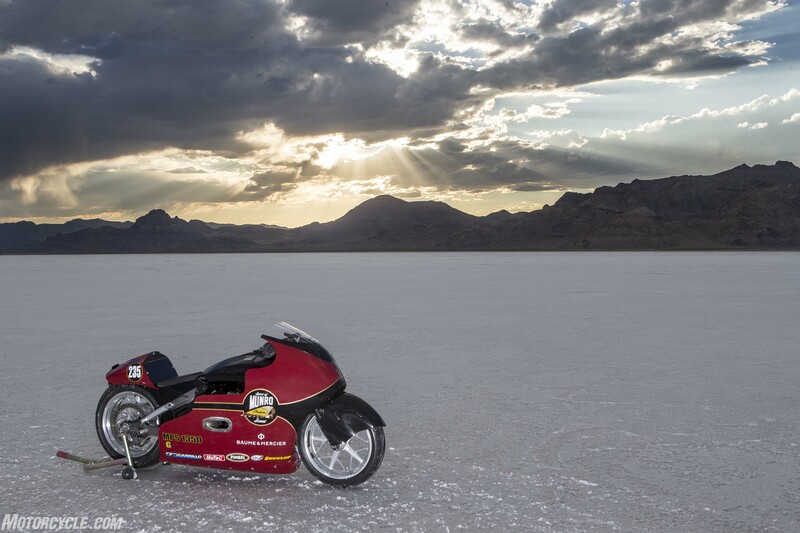 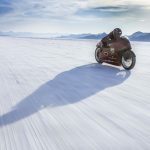 When motorcyclists think of the legendary Bonneville Salt Flats, I’d bet most would envision either Rollie Free aboard a Vincent in his bathing suit or Burt Munro, whose historic land-speed record was immortalized in the Anthony Hopkins film, The World’s Fastest Indian. 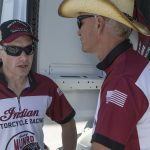 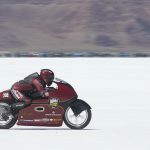 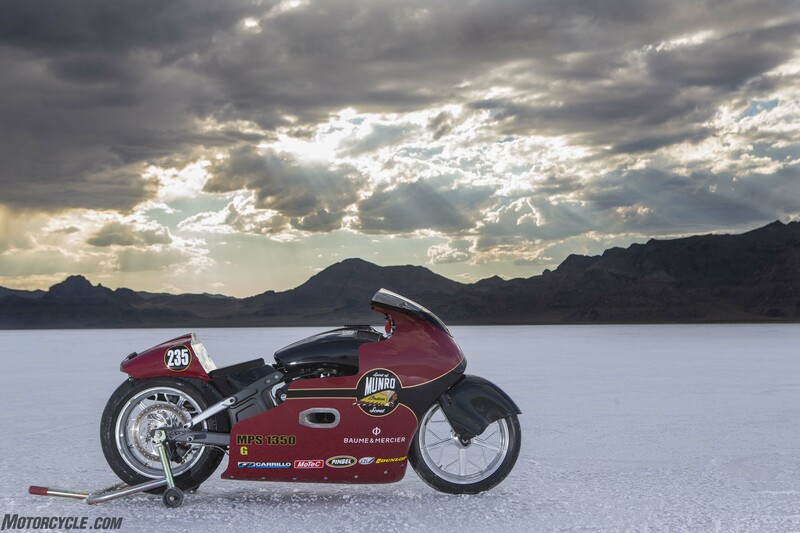 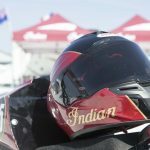 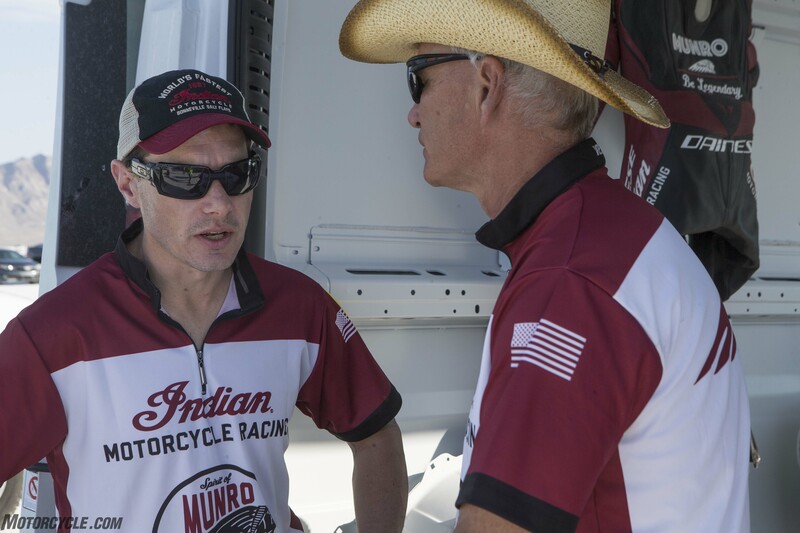 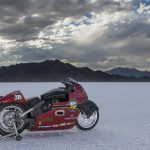 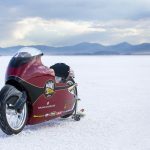 Indian Motorcycle kicked off the 69th annual Bonneville Speed Week by paying tribute to the 50th anniversary of Burt Munro’s achievement. 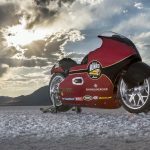 That tribute involved modifying a 2017 Indian Scout into a land-speed racer. 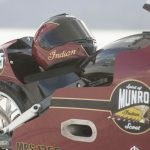 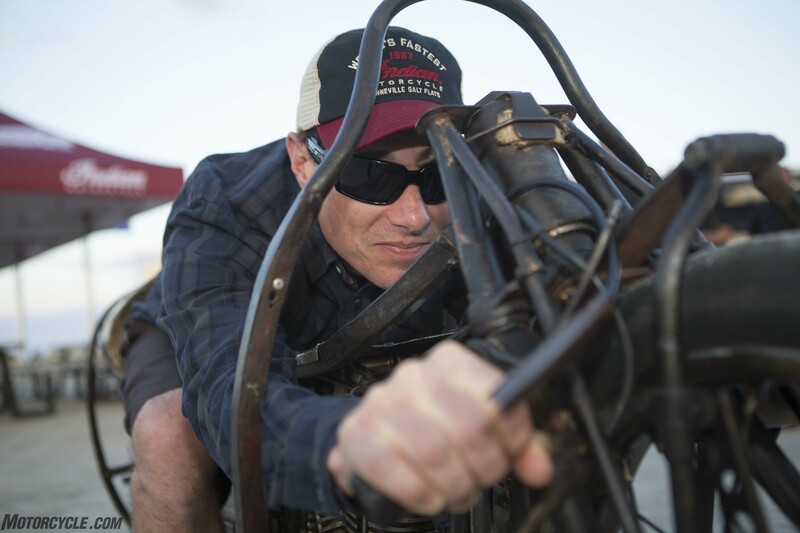 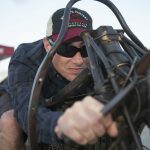 Piloting the “Spirit Of Munro” would be Burt Munro’s great-grand-nephew, Lee Munro, who would blast across the same salt his famous relative did half a century earlier. 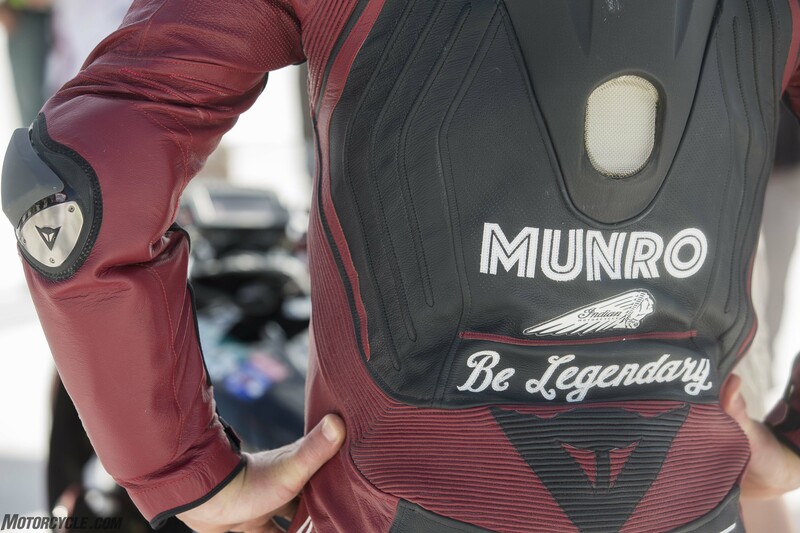 Fun Fact: Munro’s original first name was Bert, but he changed it to Burt after it was misspelled in a 1957 American motorcycle magazine. 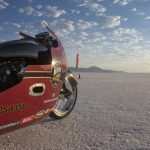 The fastest speed Burt Munro ever clocked at Bonneville was 190.07 mph in 1967, but that was on a one-way run that didn’t qualify as an official record. He was credited with an official record speed of 183.59 mph, an incredible achievement for a motorcycle/engine originally constructed in 1920! 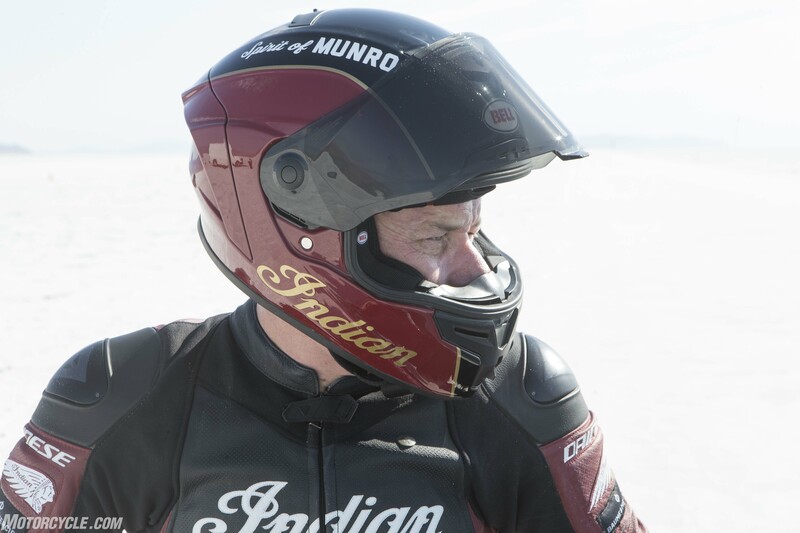 John Munro, Burt’s son, came to Bonneville to see the Spirit of Munro run on the salt. 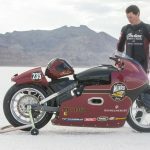 John is responsible for upping his dad’s record to 184.087 mph in 2014, 36 years after Burt’s passing, when he noticed a calculation error made when determining the bike’s actual top speed in 1967. 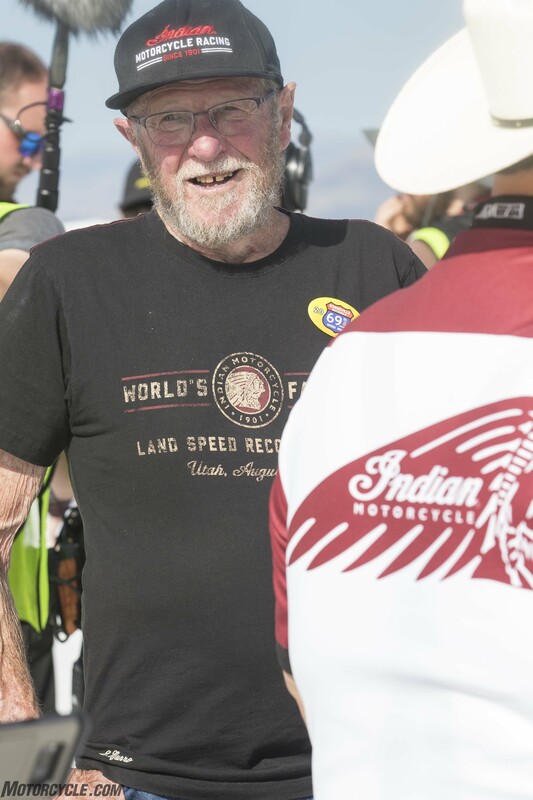 In the background is Lee Munro, whose grandfather is first cousins with Burt, best we could make out through John’s thick Kiwi accent. 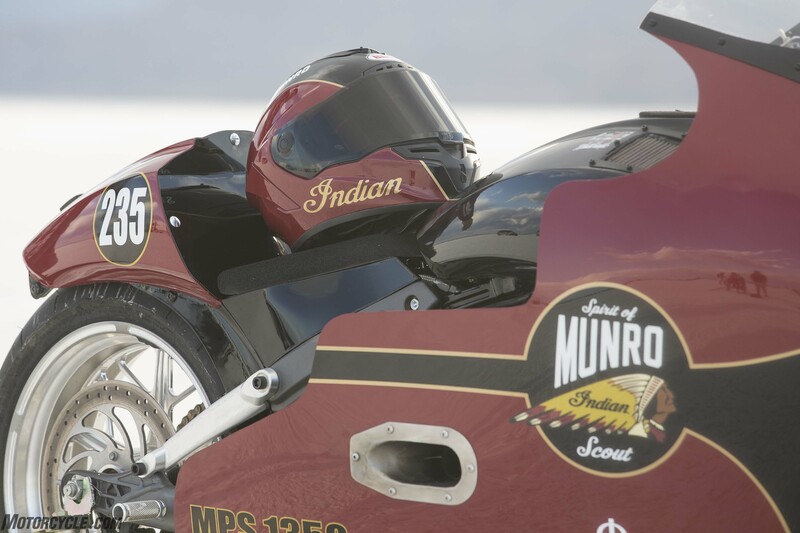 In the case of the Spirit of Munro, Indian took a Scout production model and modded the motor, lowered the chassis and wrapped it in aerodynamic bodywork. 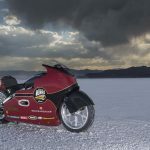 Burt Munro’s record of 183.59 mph would not be challenged, as it was set in the 1000cc class and the modern Scout’s stock engine displaces 1133cc. 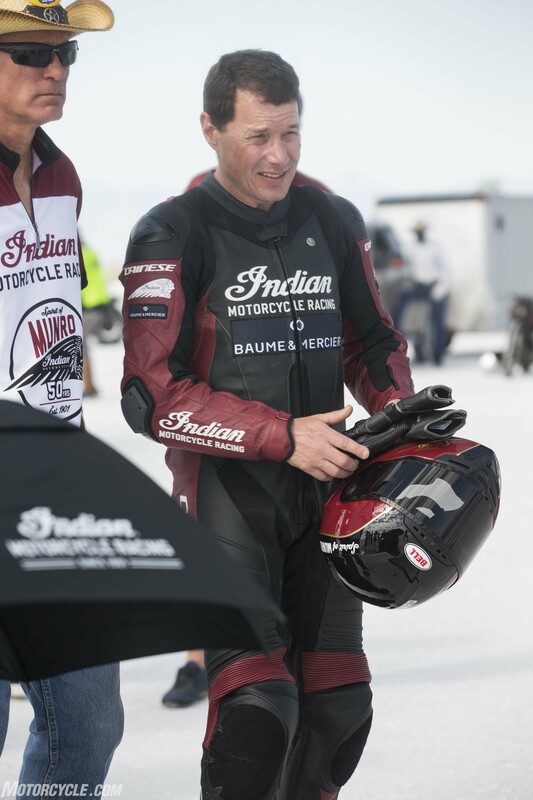 Instead, Indian enlarged the bore to yield 1299cc, which places the bike in the 1350cc category. 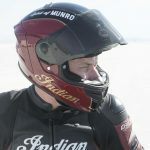 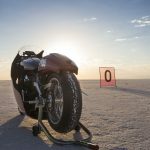 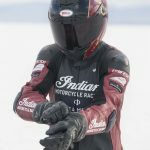 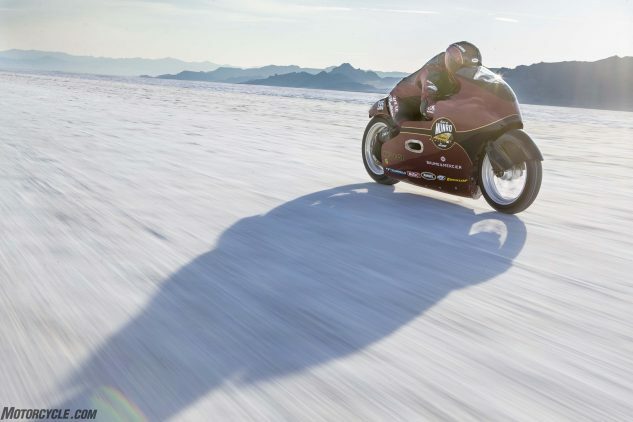 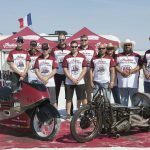 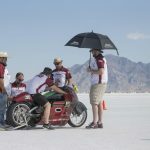 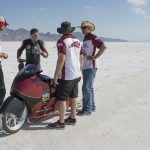 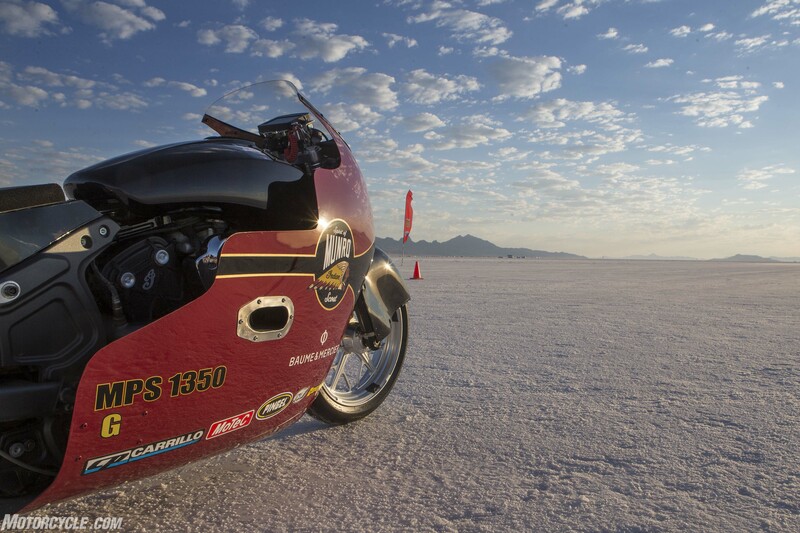 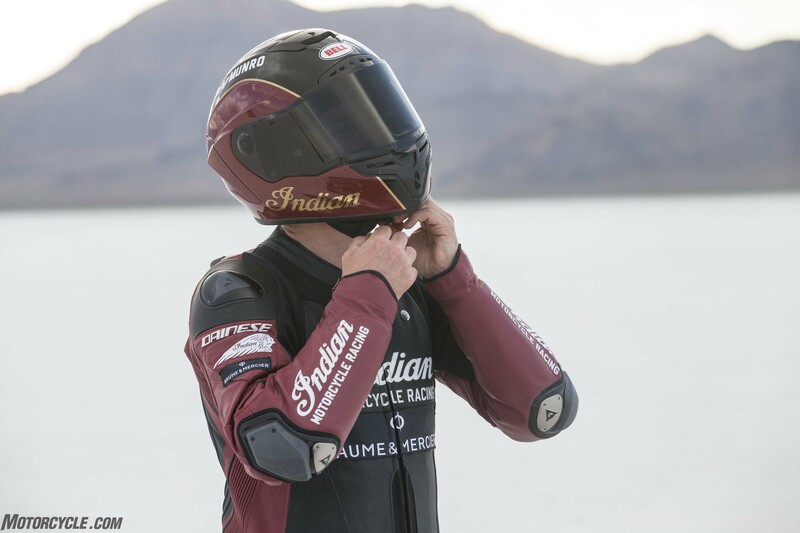 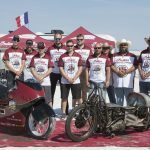 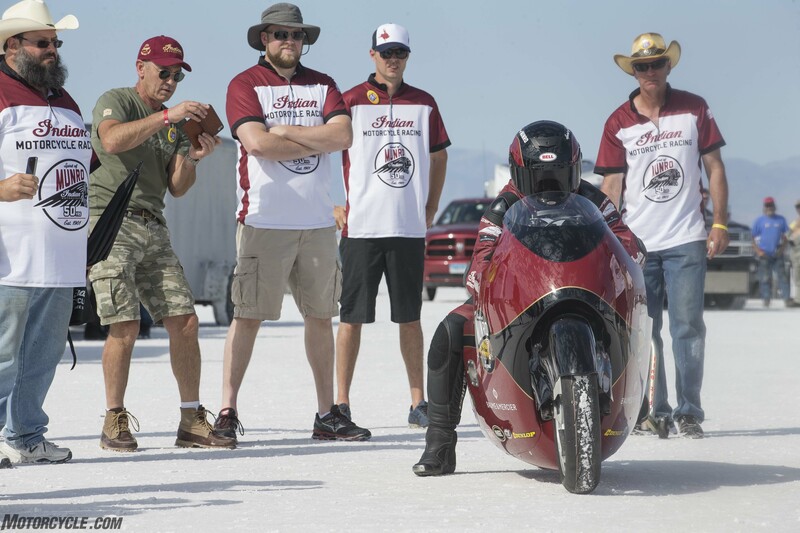 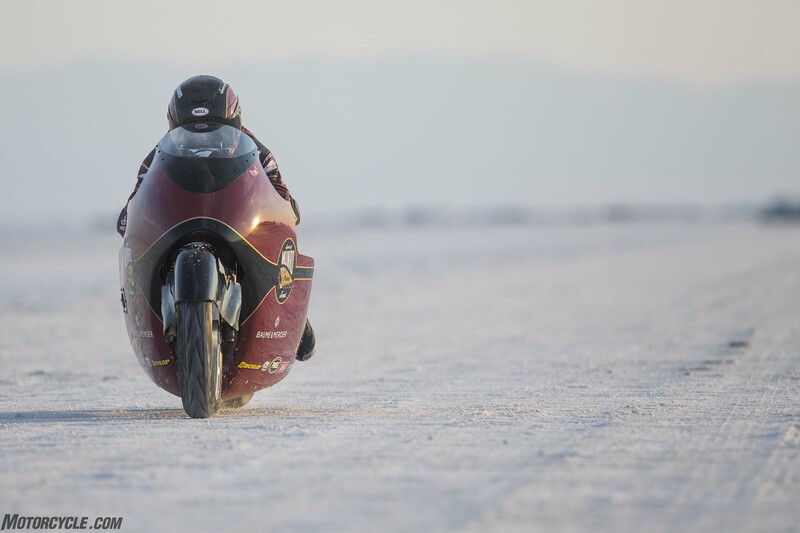 Prior to Speed Week at Bonneville in August, the Indian team – consisting mostly of volunteers working in their spare time – had shakedown runs at El Mirage, a dry lakebed in California’s Mojave desert. 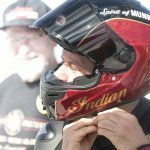 Lee Munro completed his rookie runs in May, then returned in July for the SCTA (Southern California Timing Association) event. 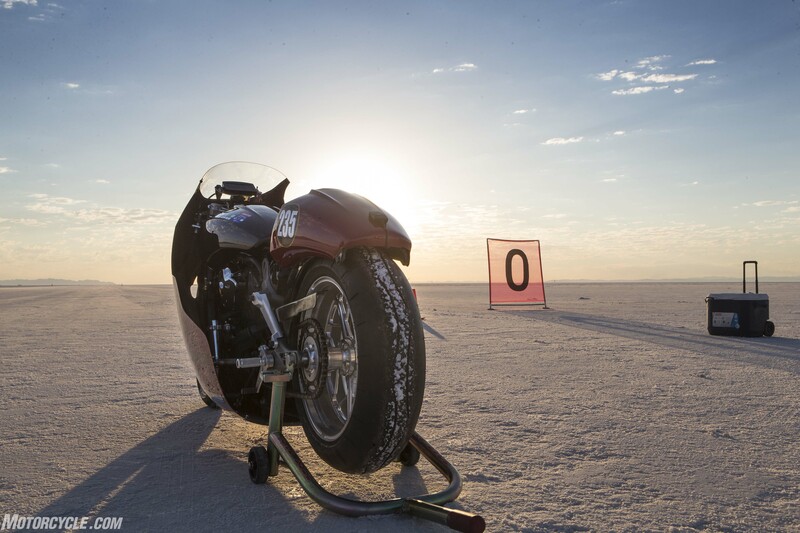 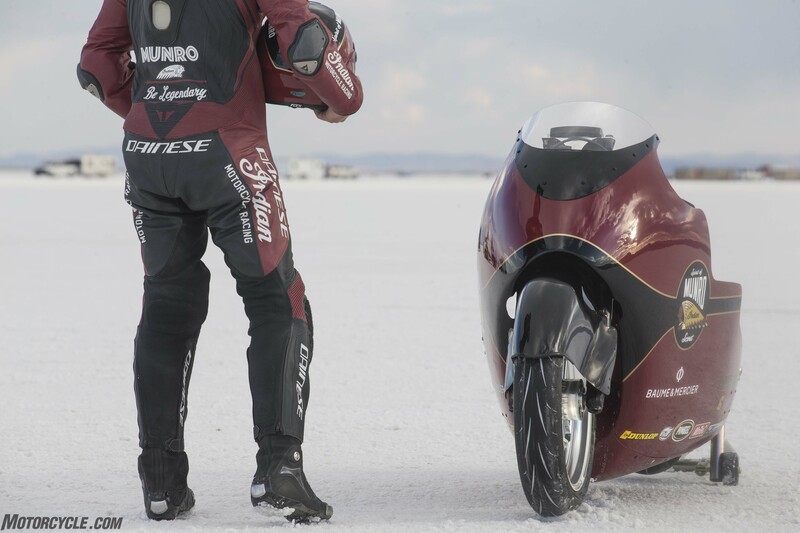 Munro rumbled across the dry lake at a speed of 186.681 mph, setting a new record in the 1350cc MPS (Modified Partial Streamliner) class. More spirit of Munro: Bob Lewis and the 1946 Indian Chief he bought in high school. 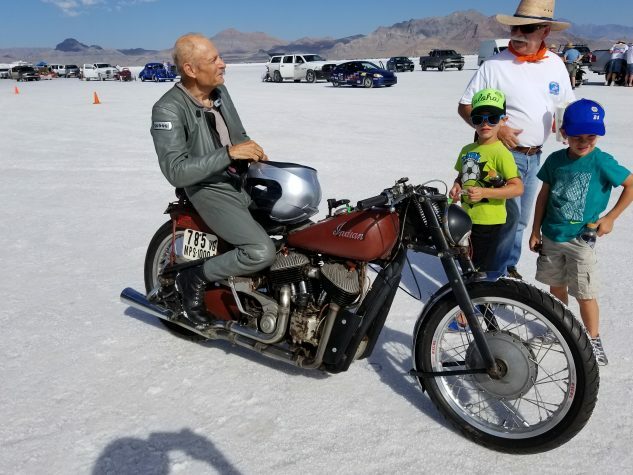 Lewis declined to share his age, admitting only to being older than his bike, but a member of his pit crew revealed to a colleague Lewis is 80! 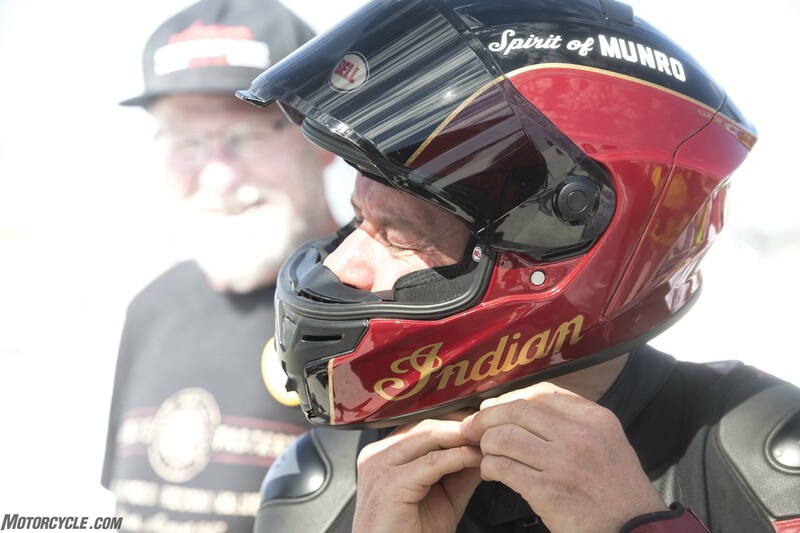 Lewis told us the Chief’s 82 c.i. 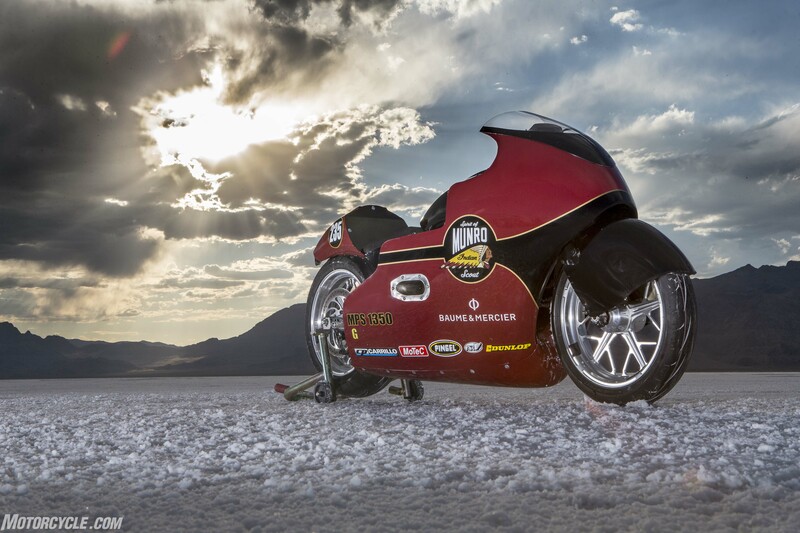 motor has powered the bike to 128 mph. 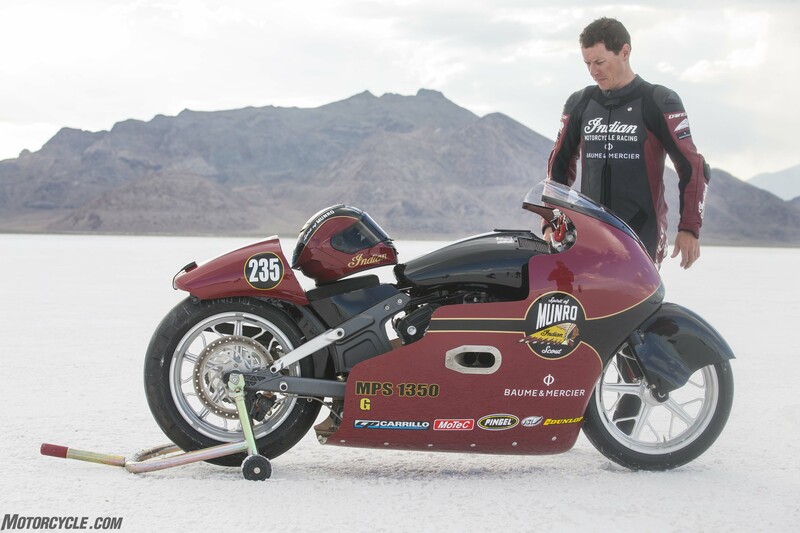 He was shooting for 130 mph this year. Not bad for an octogenarian on a kickstart motorbike! 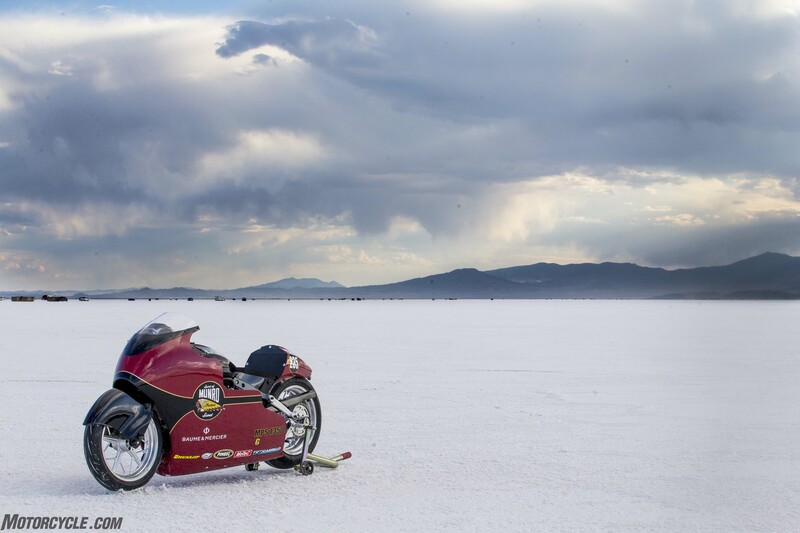 Photo by Duke. 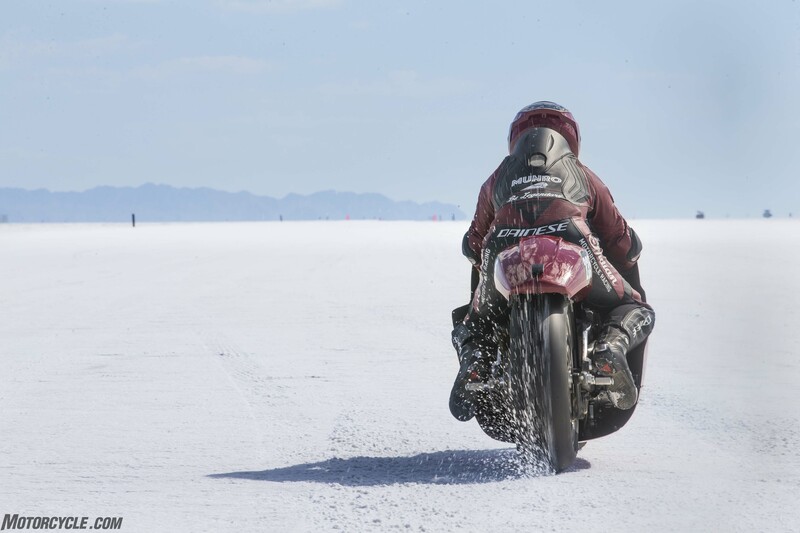 One month later and we’re on the iconic salt flats of Bonneville admiring the curvaceous and smoothly surfaced Spirit Of Munro. 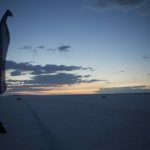 The backdrop of mile after mile of white surface is otherworldly and a sight forever seared into the minds of anyone who has seen it in person. 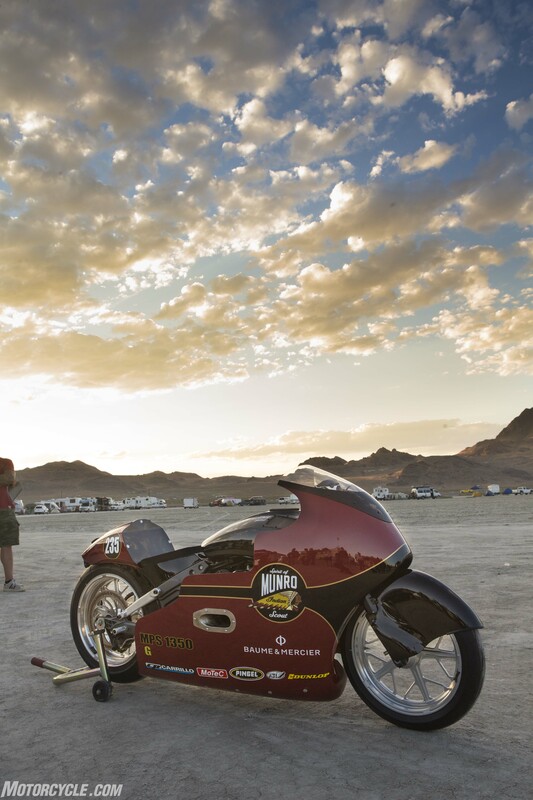 The evening before racing began, Indian pulled out the Spirit Of Munro at sunset to introduce the slippery bike and Lee Munro to the assembled media. 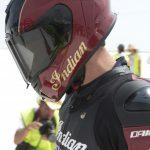 More eye candy was revealed when Indian reps cracked open a crate and rolled out one of the replicas of Burt’s bike that was used in the feature film. 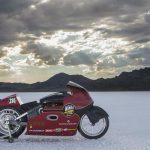 To riders raised on beefy twin-spar aluminum frames, this looked more like a collection of coat hangers than a 190-mph motorcycle! 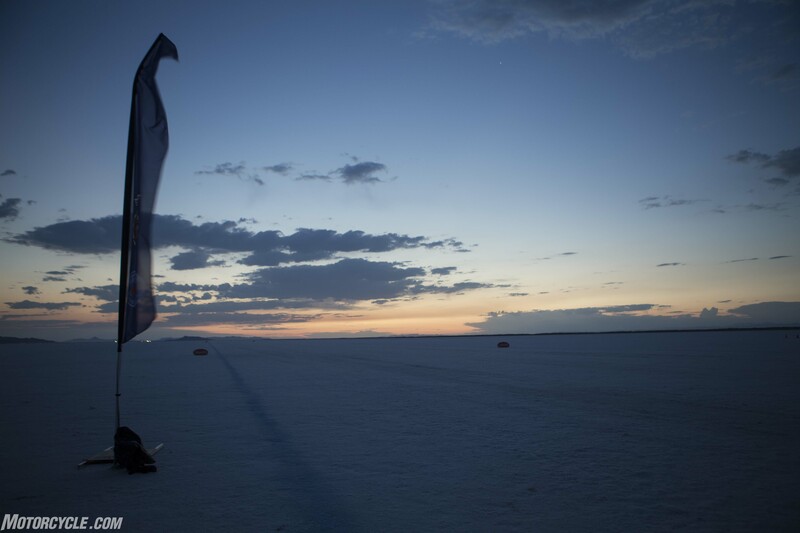 The Indian team was up before the crack of dawn the next morning, getting Lee set for his first blast across the salt. 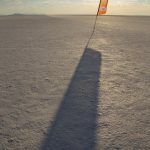 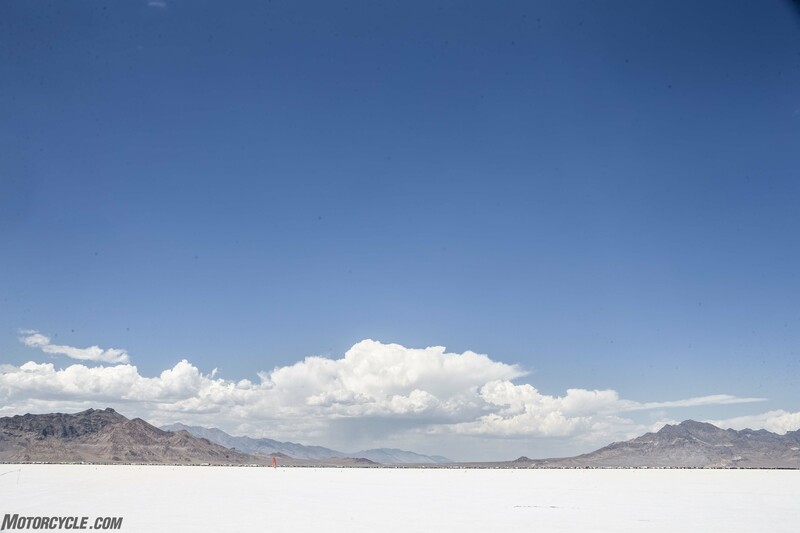 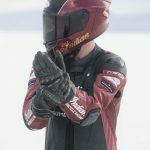 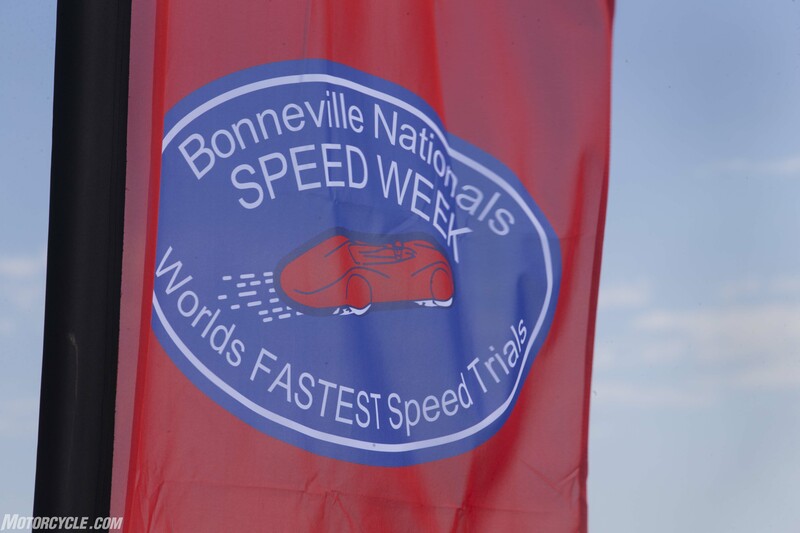 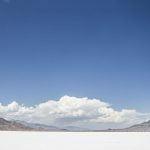 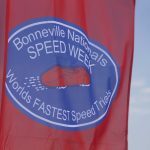 They chose the shorter of two courses at Bonneville for the salt shakedown run, although short in Bonneville terms means up to five miles in length. 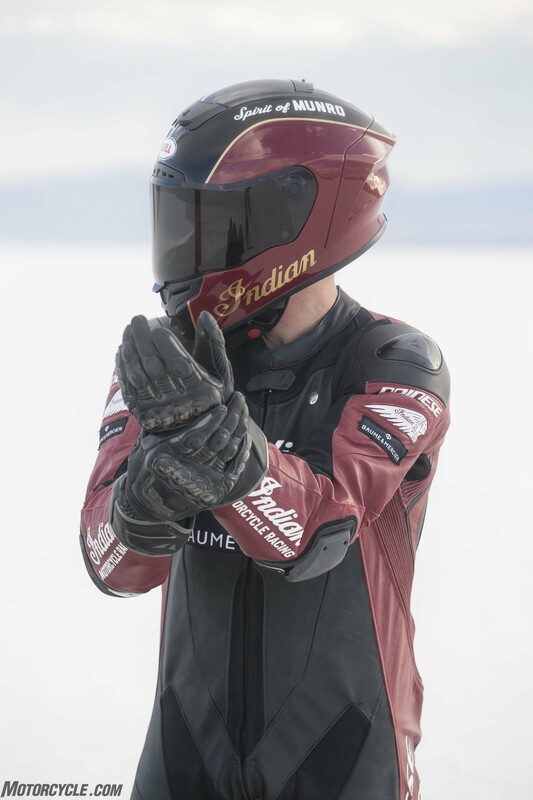 Lee, accustomed to racing, looked a bit nervous but not apprehensive as the Spirit was fired up and he strapped on his helmet. 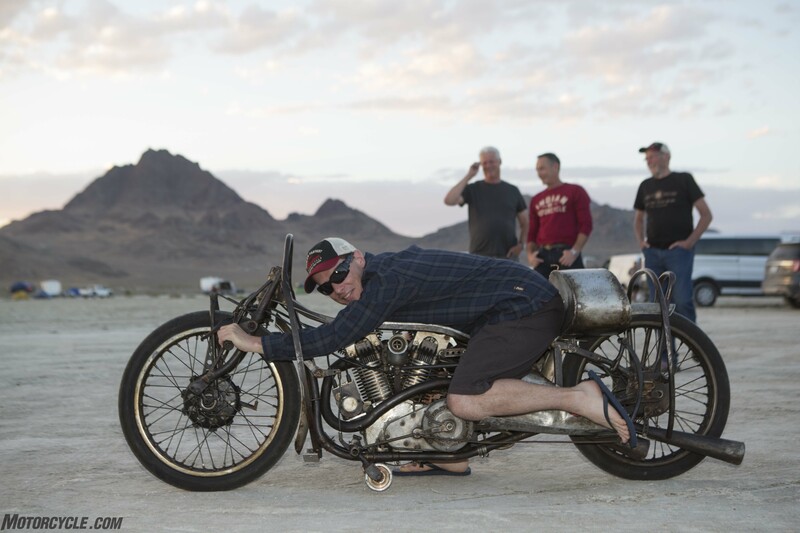 The modded Scout sounded angry as Lee fed out its clutch and carefully applied power. 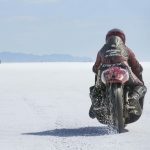 After shifting to second gear, he twisted the throttle harder and soon found out that Bonneville’s salt didn’t have enough grip to hook up the 190mm-wide rear Dunlop running 25 psi of air. 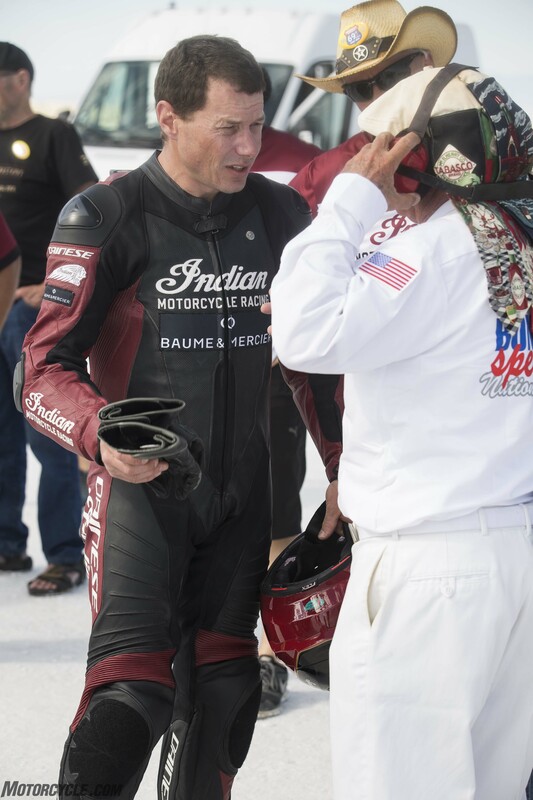 Backing off briefly, traction was regained and then propelled Lee and the Indian to higher and higher speeds. 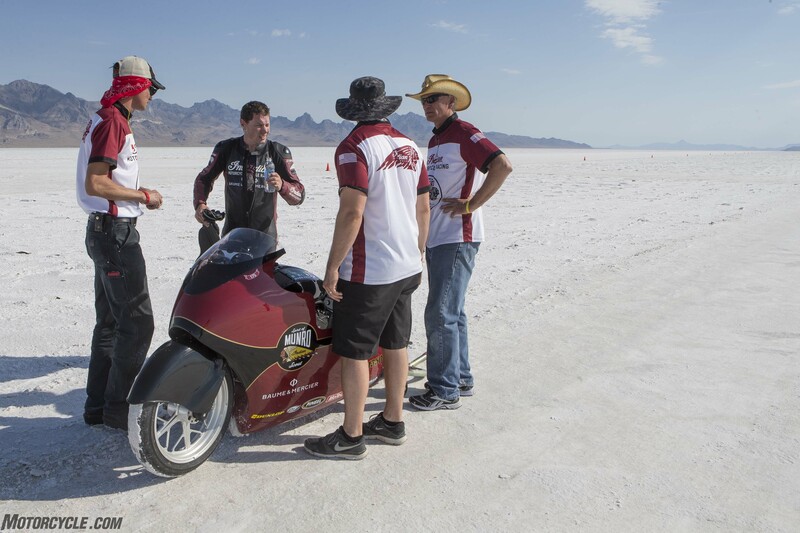 They registered 180.7 mph at the mile-2 marker, then 189.6 a quarter mile later. 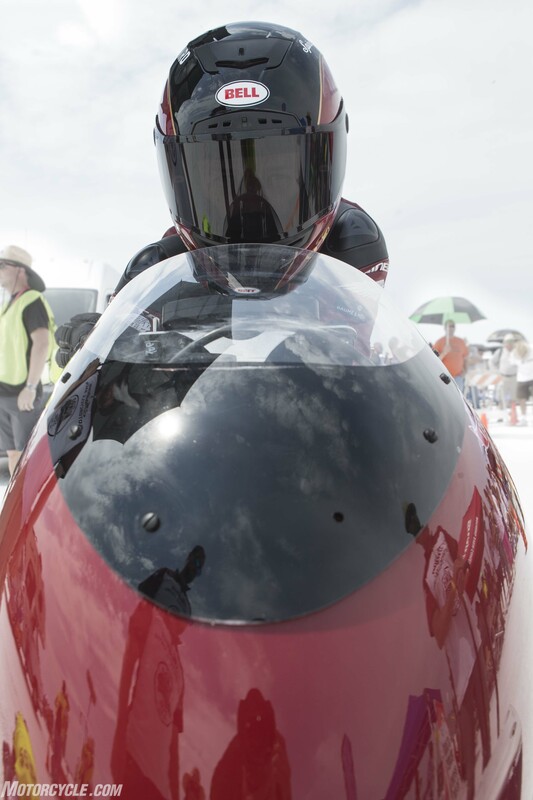 Finally, at mile 3, they hit a very respectable 191.286 mph. 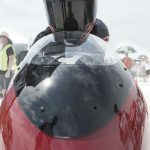 With 191 mph already in the bag, achieving the goal of hitting the double-ton seemed to be in reach. 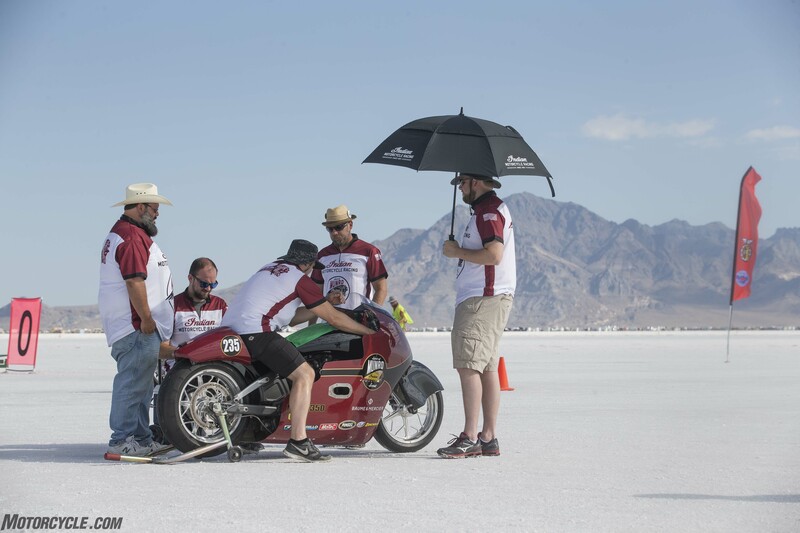 Unfortunately, on the next run a technical error in the timing equipment resulted in no speed being registered. 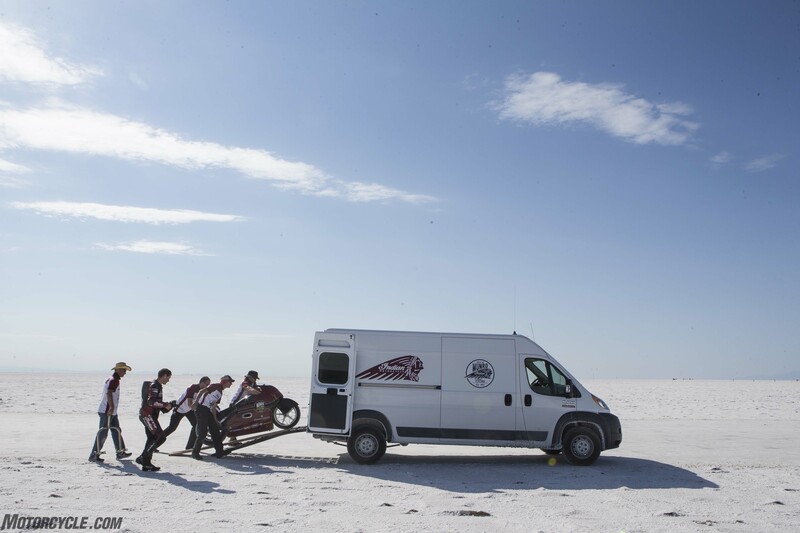 Already late in the afternoon, the team decided to call it a day and try again first thing the next morning. 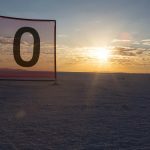 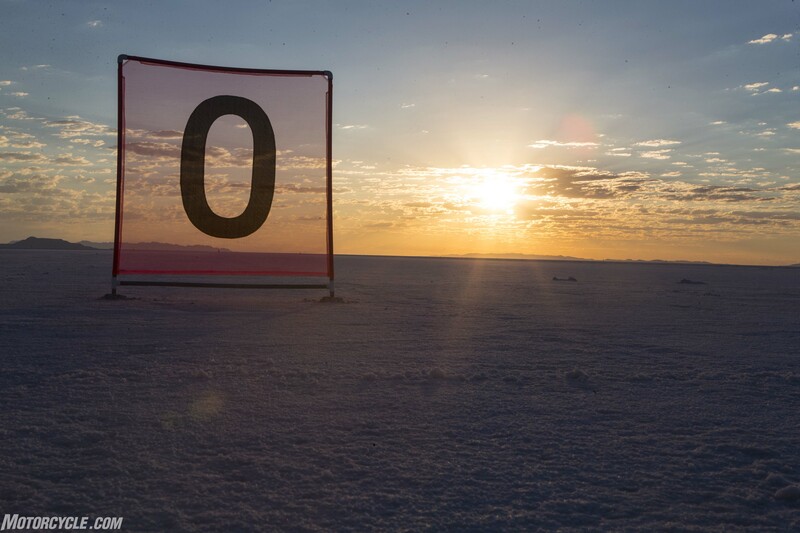 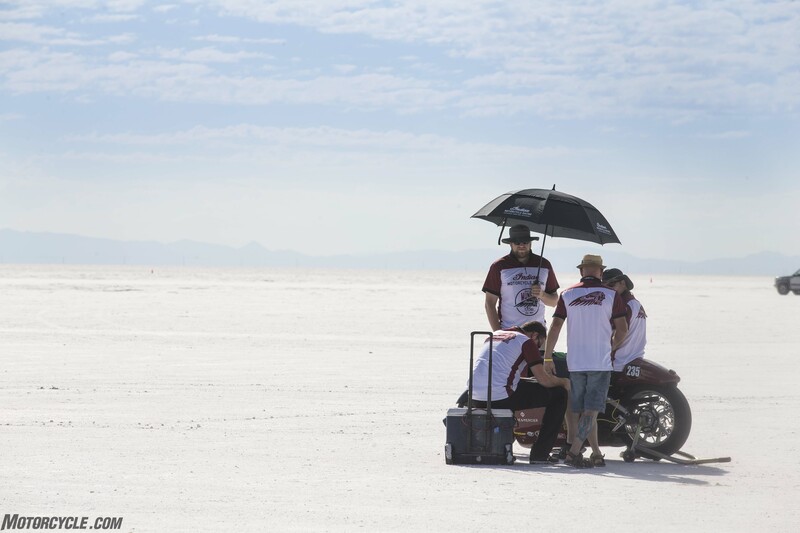 Another sunny day dawned at Bonneville, and the team decided to head over to the Bonneville’s long course, which stretches out for an astonishing nine miles in length. 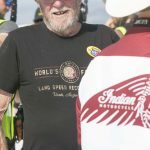 However, the wind was picking up and it was blowing toward the starting line of the course, meaning that Lee would be riding into a headwind. 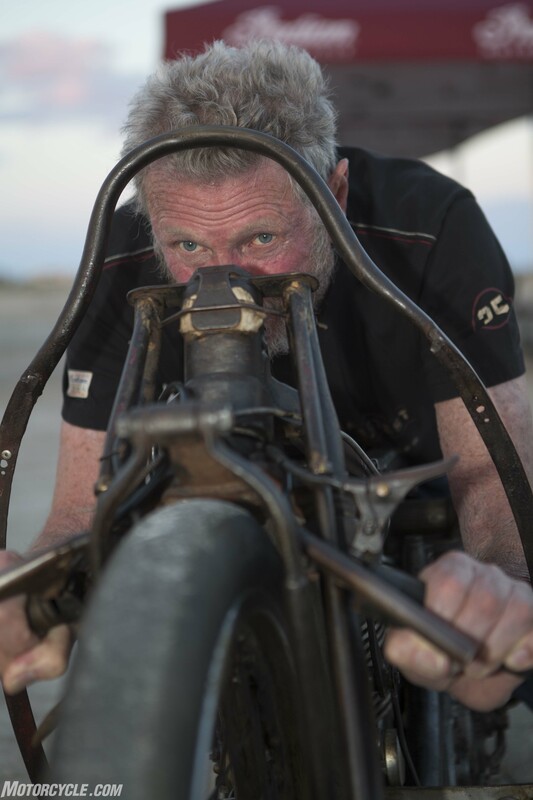 A larger rear sprocket was fitted to better thrust it through the air. 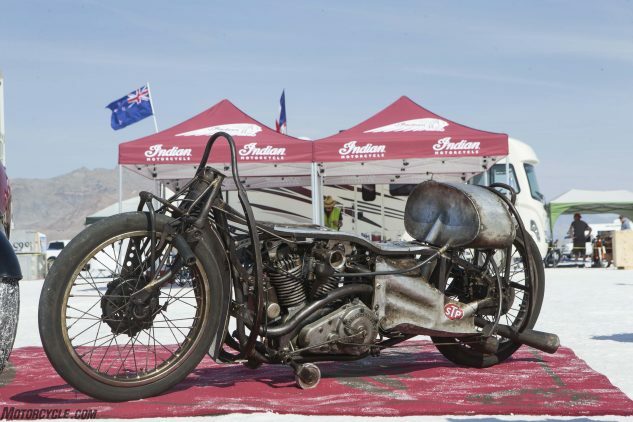 To accommodate the long course’s bumpier surface and to aid traction, Indian dropped the pressure of the rear tire to 19.5 psi. 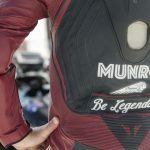 Lee Munro took off from the starting line better than the previous day’s runs, applying power smoothly but deliberately through the bottom two gears, then getting slight wheelspin in third as he dialed on the juice, finally hooking up solidly in fourth. 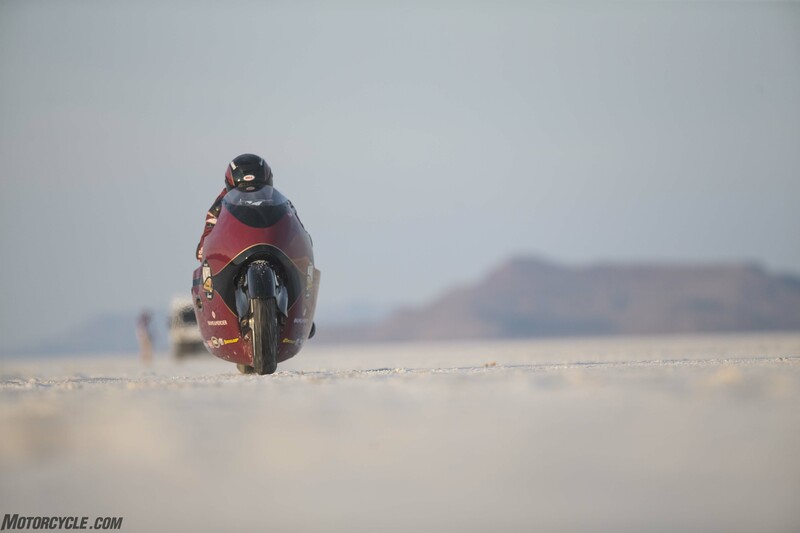 He was traveling at 181.3 mph at the 2-mile mark and 186.415 at mile 3. 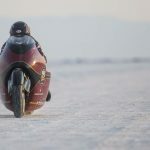 Sadly, that’s all the Spirit had in her that day, falling well short of hitting her rev limiter. 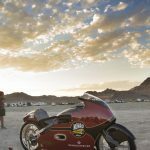 Dry and hot weather translated into the equivalent of a 6000-foot altitude, which, combined with a 10-mph headwind, capped the limit of what was possible in those atmospheric conditions. 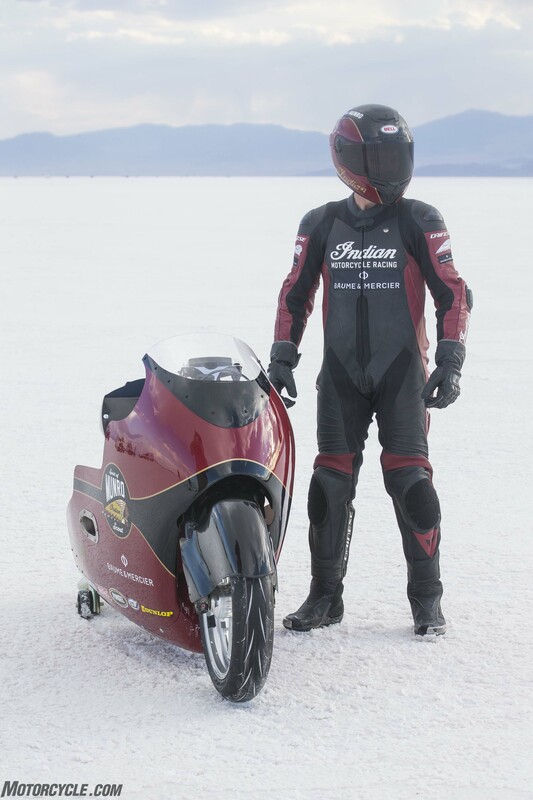 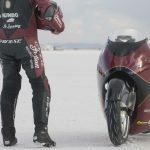 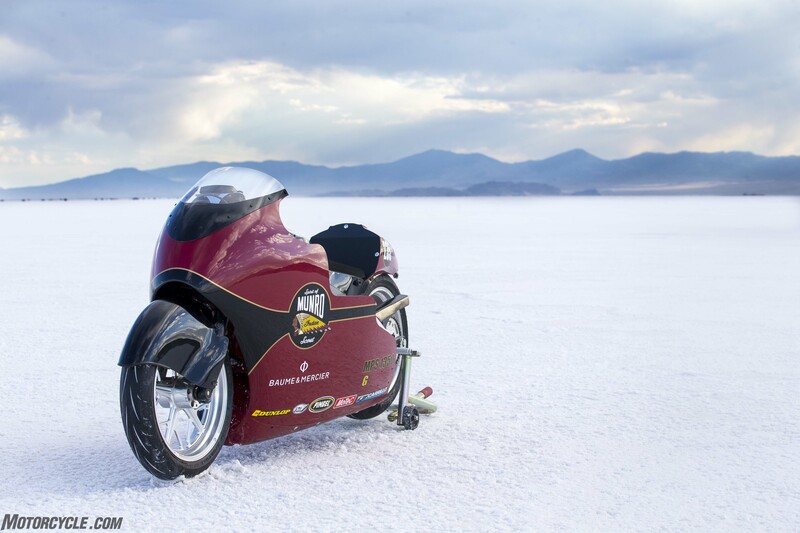 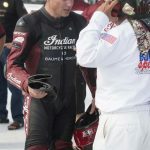 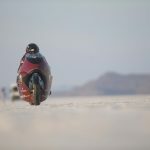 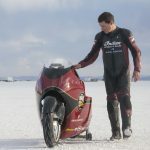 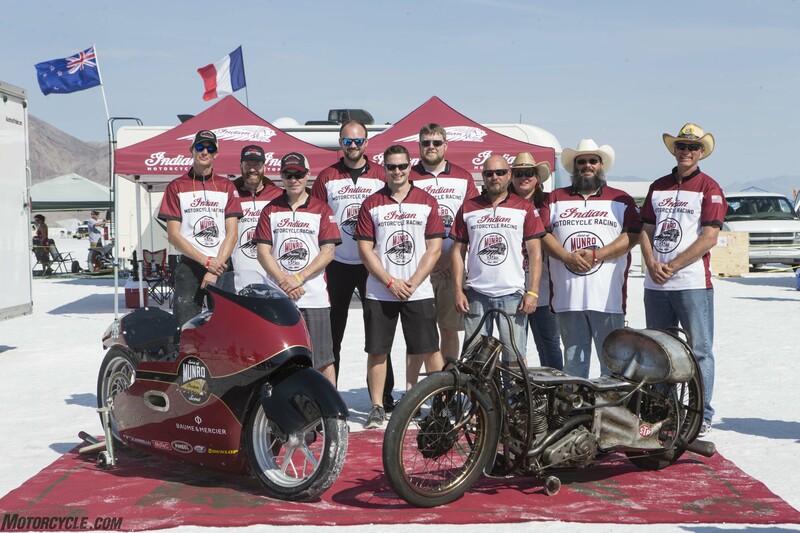 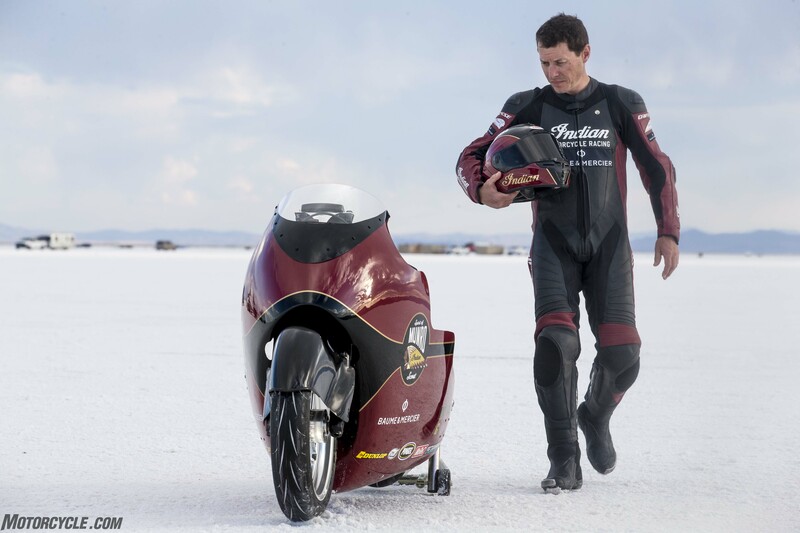 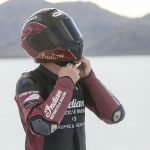 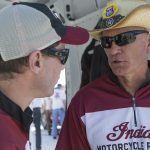 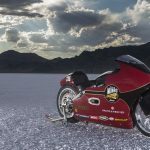 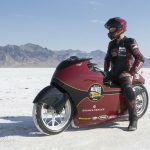 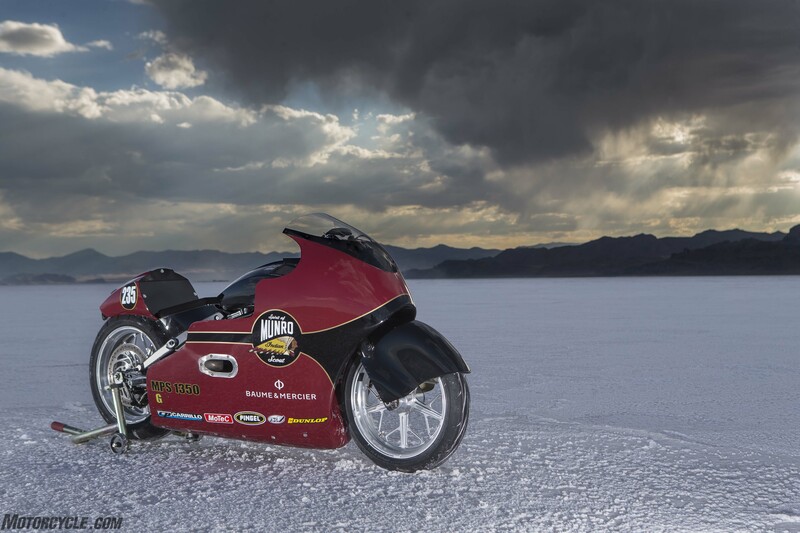 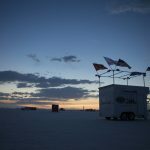 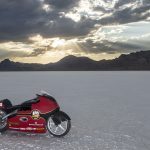 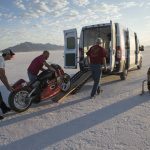 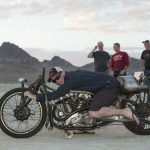 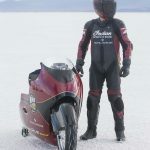 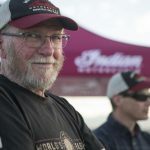 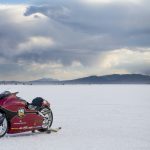 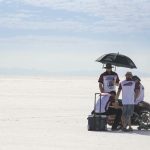 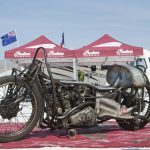 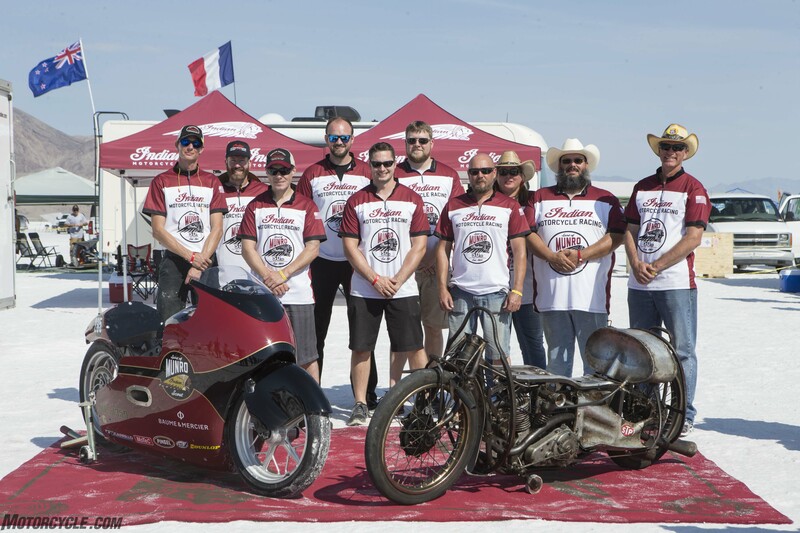 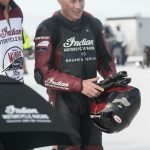 Although stymied from their goal of 200 mph, the Indian crew celebrated that evening by showing The World’s Fastest Indian in the team’s camping area, with Bonneville attendees invited to join in the commemorative screening. 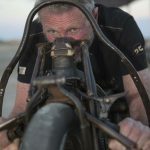 The film was introduced by the film’s director, Roger Donaldson, and John and Lee Munro, who shared anecdotes about the making of the film and the achievements of Burt Munro. 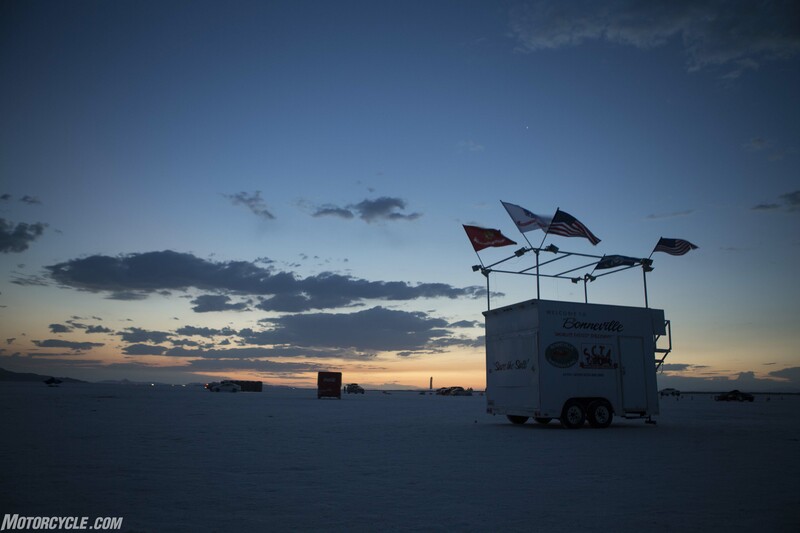 It was another early morning the next day, but for me, it was to drive to Salt Lake City and fly home. 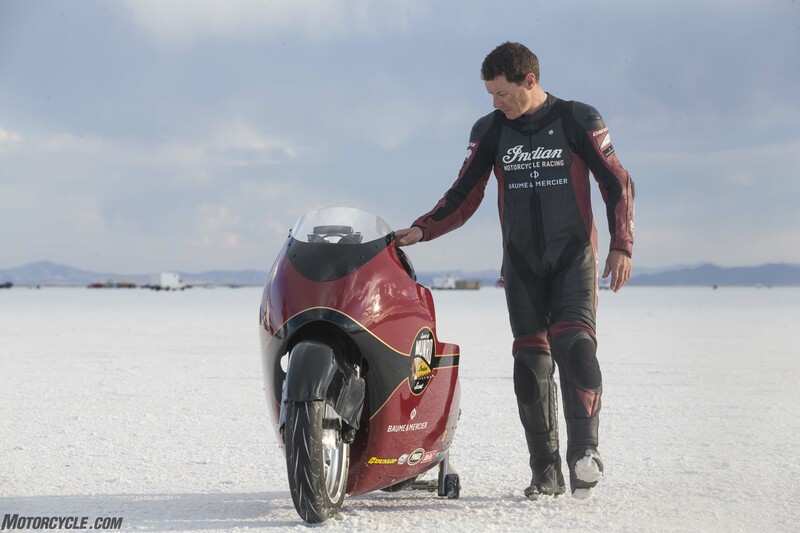 I wouldn’t see the Indian make its next run, but it turned out to be uneventful in terms of increasing speed. 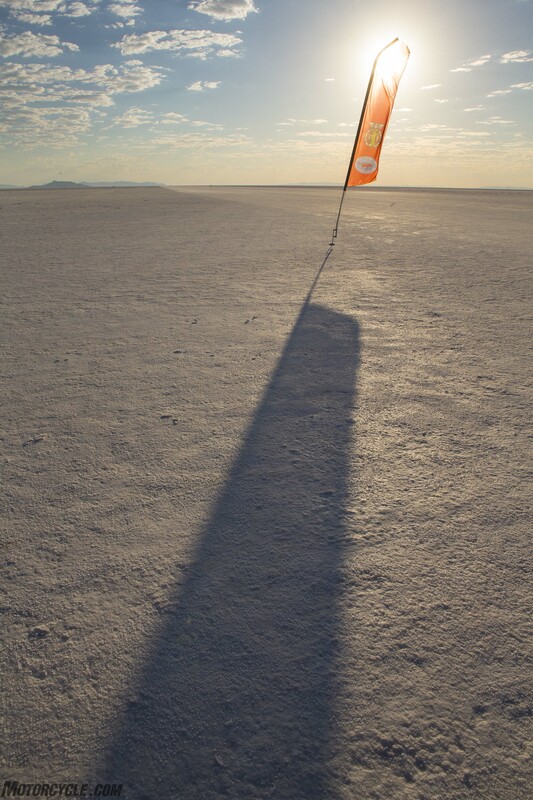 The surface of the long course, re-routed after a spectacular high-speed crash the day before, forced Munro to exit his run before completing the timed section. 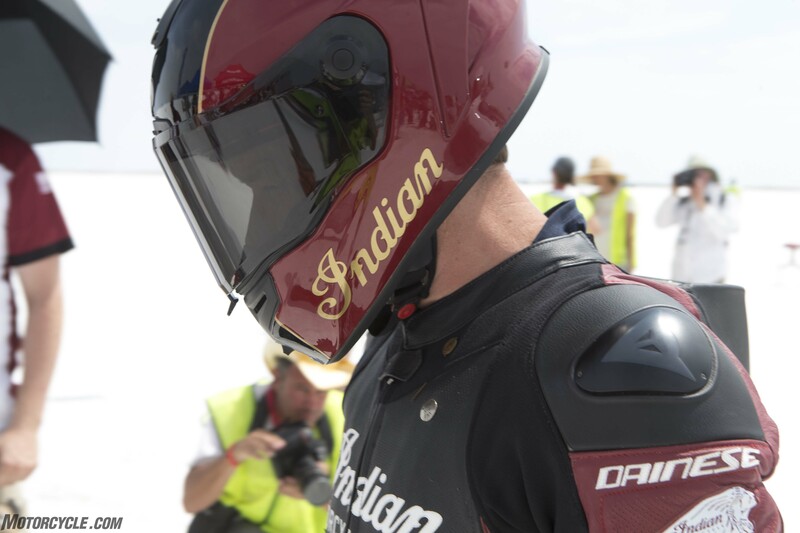 So, overall, I think it’d be fair to say Indian’s effort at Bonneville this year was minimally successful in performance but highly effective in marketing. 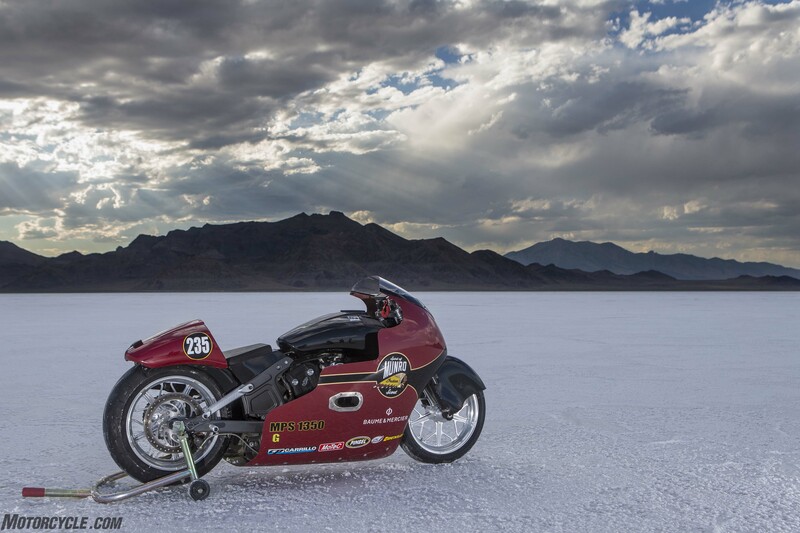 The Spirit Of Munro racebike always had crowds gathered around it, and hearing hundreds of people cheering when Anthony Hopkins as Burt Munro sets a land-speed record on an Indian Scout made me feel that the abandonment of Victory Motorcycles in favor of Indian Motorcycle was a smart business decision for Polaris Industries. 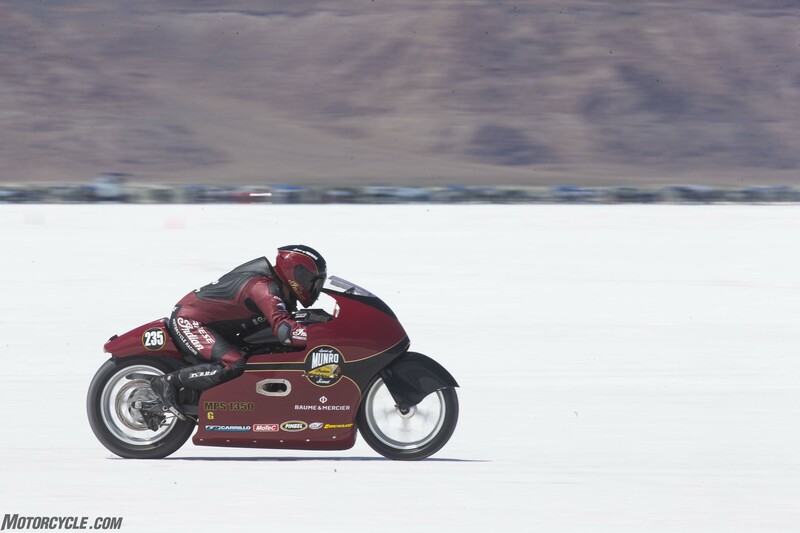 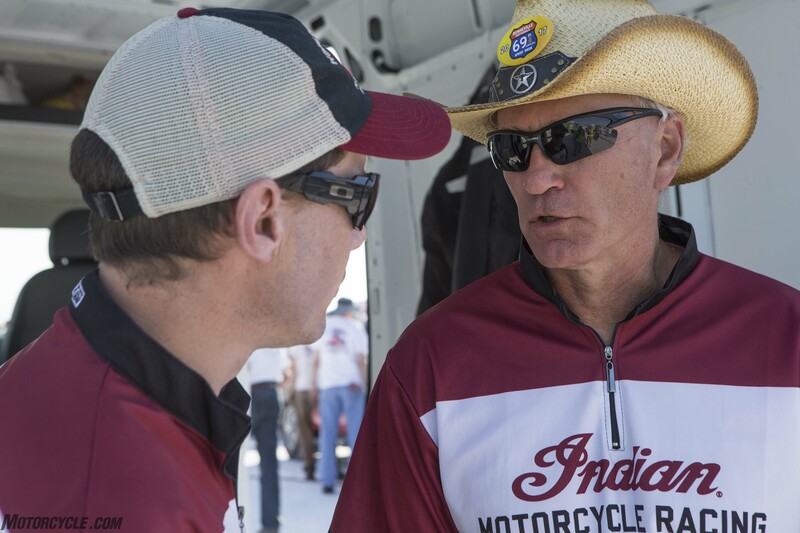 Steve Menneto, Polaris’s VP of Motorcycles, was at Bonneville supporting Indian’s efforts on the salt. 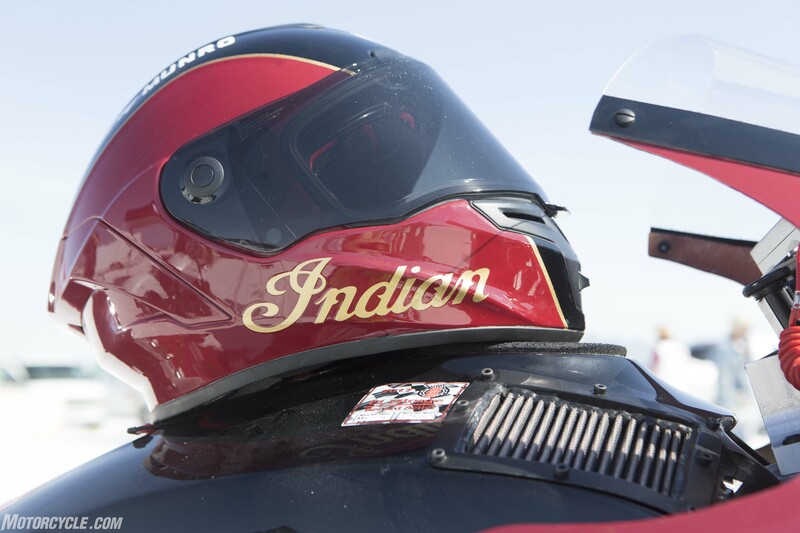 He told me Indian’s sales continue to increase, up somewhere in the mid-20% range over last year. 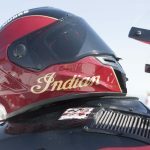 If you’re yet unconvinced putting the company’s full weight into Indian was a shrewd move, consider this: Menneto says sales numbers of Indians are already three times better than Victory’s best years.